Before you buy any Dollar Store instructions, go to your local Dollar Store (Quid Store in the U.K.) and make sure you can get the ingredients. Not all Dollar Stores are alike and you may have to hunt through several to find just what you need to make these magic props. You'll need a large clear plastic canister from the Dollar Store, about the size of a traditional cookie (biscuits in the UK) jar. You'll also need a bowl to catch the candy in for the ending. If using this as a cookie jar, you'll need individual cellophane wrapped cookies, which is a pain in the neck and they sometimes come out all crumbly, so I prefer using cellophane wrapped candies just because they are more durable... but it's YOUR trick, so suit yourself. I will then show you how to convert the canister so that you bring it out obviously empty and tell the kids you are going to pass around some candy (cookies-biscuits-whatever) now from your magic candy jar. When they tell you the jar is empty, look surprised for a moment, then smile and tell them it looks empty to THEM because they don't have magic eyes that can see invisible candy. Unscrew the lid (or do whatever you have to do to open your canister) and hold the canister out to one of the most annoying kids in the audience who has been on your case all through the show. "Go ahead and reach in the jar," you tell him ( I know it's a boy!). He reaches into the jar and finds nothing. "Nothing? No candy for you? I'm so sorry, you see this jar was given to me by Santa Claus himself and the jar knows if you've been naughty or nice. Let me have someone else try it." 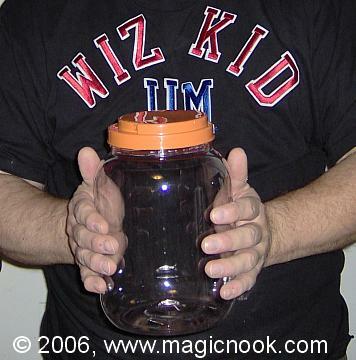 This time you hold the jar out to someone who has been very well behaved during your show. The child reaches in and removes a piece of candy from the jar. "See? If you've been nice, the jar rewards you by offering you a piece of invisible candy!" With that as your basic premise, you can continue to have some children find candy in the jar, while others find nothing. However, at the end, you hold the jar over an empty candy bowl and enough candy tumbles out of the jar for each person to have a piece, even those the jar deemed "naughty." There's no guarantee that the annoying hecklers will reform their ways by the end of your show, but one can always hope!